Winter Patriot: ... And The 'Reverse Bang For The Buck' Award Goes To ... MoveOn! ... And The 'Reverse Bang For The Buck' Award Goes To ... MoveOn! 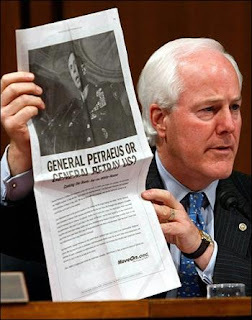 Robert Parry dissects the MoveOn / Petraeus / New York Times debacle, focusing on return on investment, rather than the more commonly discussed angle, freedom of speech. MoveOn has taken $142,083 from American donors and given it to the New York Times for the privilege of running an ad that served to undermine the goal of reining in President Bush’s Iraq War. Talk about getting a reverse bang for your buck. The New York Times is now and has always been our enemy. Let them raise their own money. I can't even imagine what sort of coverage this cold website could provide if it had a hundred thousand a year to work with. But even without that ... What an unbelievable waste of money!